And the huge online retailer has a platform that no other competitor can match, attracting 180 million U.S. shoppers per month and offering a streaming entertainment service. For more than two decades, Jeff Bezos has famously sacrificed profit for growth, persuading Wall Street that Amazon.com was best served by pouring money into the logistical nuts and bolts that have turned his company into the Wal-Mart of the web. More recently, investors have found solace in the company’s profitable cloud services business, which has helped offset losses in e-commerce. Still, for the past five years Amazon’s average profit margins have languished at about 1 percent. “Advertising is the most profitable business in the world,” said Jay Kahn, a partner at Light Street Capital, who notes that Chinese e-commerce giant Alibaba Group Holding gets more than half of its revenue from ads. “For Amazon, advertising is going to be more profitable than its cloud business.” Amazon declined to comment. For years, Amazon kept advertising on the site subtle for fear of alienating shoppers who had become used to choosing what to buy based largely on customer reviews and price. Amazon has been slowly giving more prominent placement to sponsored products in search results, forcing brands to buy ads to win top billing. It’s easy to see why. By 2021, advertising on websites and mobile devices will account for half of all ad spending in the U.S., capturing a greater share than television, radio, print newspapers and billboards combined, according to EMarketer. So far, that shift that has mostly benefited Google and Facebook. By contrast, Amazon has a tiny advertising business that last year generated $1.7 billion in revenue, according to EMarketer, compared with Google’s $35 billion and Facebook’s $17.4 billion. But it’s growing quickly because companies like Procter & Gamble and Mondelez see Amazon as the place to win the “digital shelf” in the same way it fought to win the physical shelf in supermarkets. Amazon has an advertising platform that no other company can match: a web store selling hundreds of millions of products, combined with a streaming entertainment service and a trove of data about customer preferences. Amazon attracts 180 million U.S. visitors each month, all or most with shopping on their mind. And as more people shop on smartphones, they’re skipping search engines like Google for Amazon’s mobile app. Advertisers are paying attention. Just as big brands pressed their ad agencies a few years ago to devise plans to get the best bang for the ad buck with Google and Facebook, they’re now demanding an “Amazon strategy.” In November, ad giant Omnicom Group set up a specialized operation just to direct ad dollars to e-commerce, particularly Amazon, which has forced consumer brands to re-evaluate marketing decisions. “It’s wreaking havoc on traditional retail models,” said George Manas, president of Omnicom’s Resolution Performance Media. 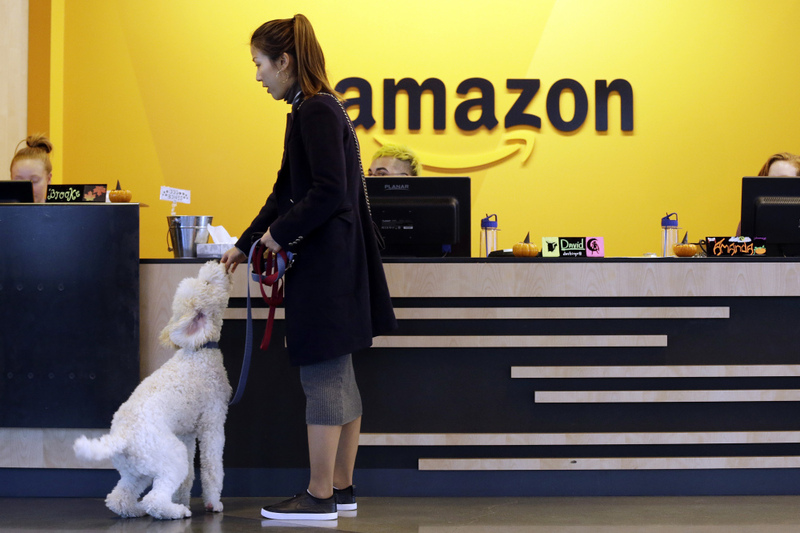 In negotiations with advertisers, Amazon bills itself as a better advertising investment than Google’s search engine and Facebook’s social media platform because people on Amazon are looking to buy, according to three people familiar with the negotiations. Amazon advertisements also offer real-time insights into how a marketing campaign is performing, a process that typically takes weeks when using traditional methods like TV commercials or coupons. Big packaged goods companies are signing on. Executives see Amazon as the future way to reach shoppers and are shifting spending from traditional advertising channels to cement their place with Amazon. Even though Amazon has small grocery market share, brands think the next few years are critical because once shoppers establish regular shopping lists online, it will be hard to woo them back. Big grocery brands and manufacturers spend $225 million on advertising and in-store promotions each year, with more money shifting to digital advertisements, according to Cadent Consulting Group. Big Food has been mired in a sales slump for years amid changes in how consumers shop and eat; having an Amazon strategy helps them signal to Wall Street they’re keeping pace with the changes.